The term refers to the phenomenon where the temperature in a city is significantly warmer than a nearby rural area, primarily because of the more intense built environment in cities. In rural areas, the soil, grass and tress use heat from the atmosphere for evapotranspiration while in the city, concrete and other dark materials in buildings and pavement absorbs and retains the heat. The narrow canyon-like streets of the city also inhibit flow of fresh air, and substantial heat is generated by air conditioners and refrigeration. As a result, the mean air temperature of a city with a million or more people can be 1-3°C (1.8–5.4°F) warmer than surrounding areas, and even more pronounced in the evening when the difference can be as high as 12°C (22°F). 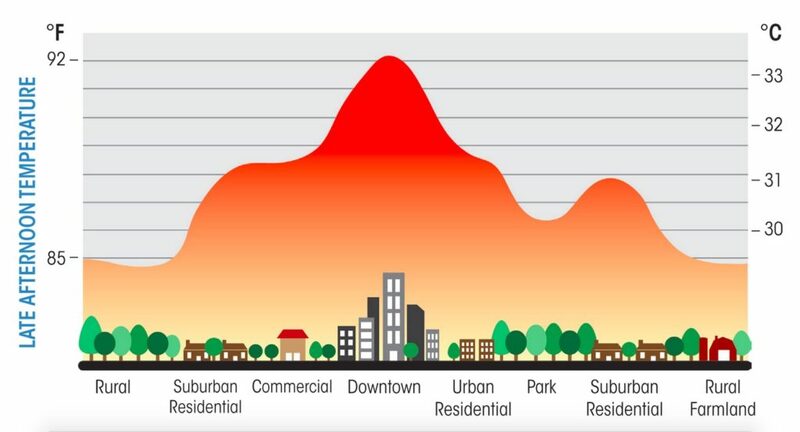 Heat islands can affect communities by increasing summertime peak energy demand, air conditioning costs, air pollution and greenhouse gas emissions, heat-related illness and mortality, and water quality. To reduce the heat island effects, rooftops can be painted white, or covered with vegetative matter, to better reflect heat and keep the buildings cooler (green roofs). And of course cities can be saturated with trees to provide shade and natural cooling. Pick a spot in a city that is devoid of any vegetative matter or shading from the sun, and one that is filled with trees and grass, even a park, and see if you can feel the difference in the temperature about you. Identify the ways of mitigating urban heat island effects that can be implemented only through government action. Identify the ways of mitigating urban heat island effects that can be implemented by private citizens, and undertake one such mitigation action, alone or with a group.